the hopes we wear on our backs, collaborative weaving project with Kacie Lyn Martinez, Summer 2018, Muncie, Indiana. 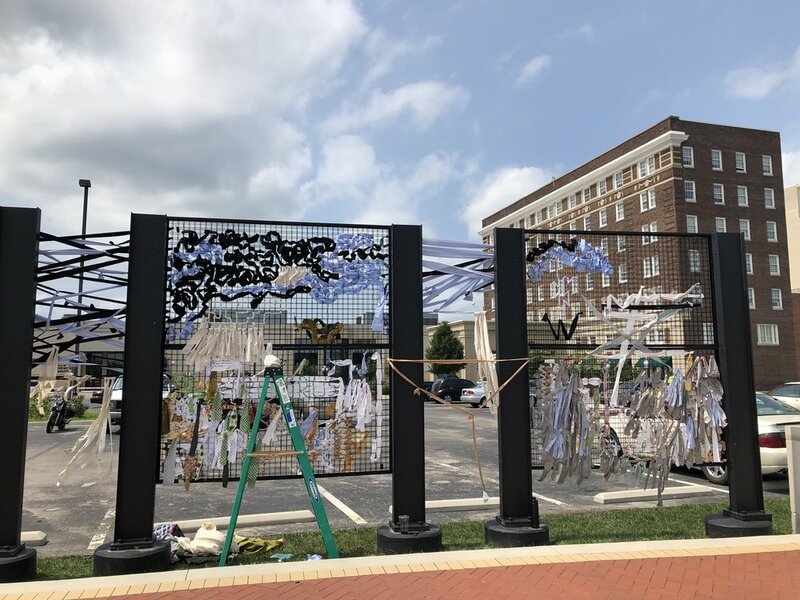 This participatory public art project by Brooklyn-based fiber artist Kacie Lyn Martinez explores the process of collectively envisioning Muncie’s future by fabricating a unifying wall of hope. the hopes we wear on our backs invited Muncie residents to write out their hopes for the city on strips of recycled clothing, called “hope strips”, and weave them into large metal grates in the Downtown Muncie park Canan Commons. 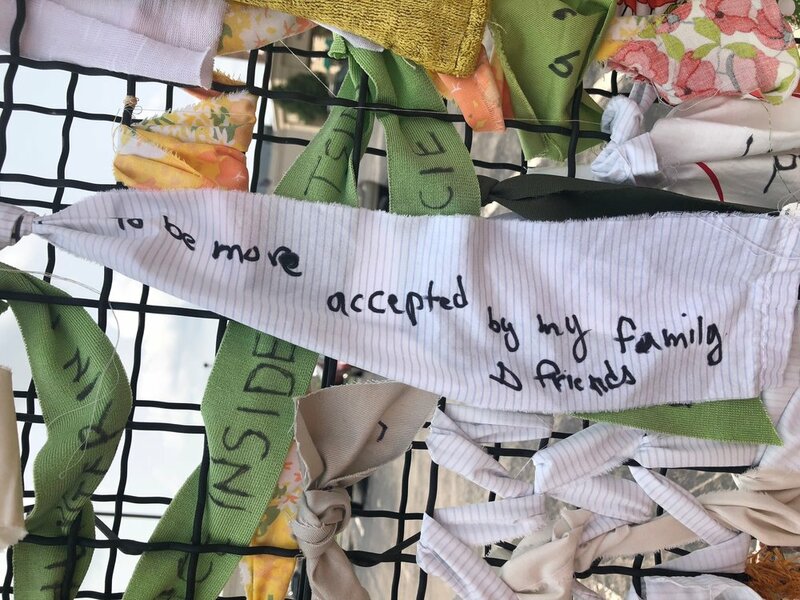 During August 2018, Kacie Lyn Martinez held community weaving hours were hundreds of participants attached their “hope strips” wove designs using piles of recycled fabric, using weaving as a form of public art, human connection, and repetitive healing flow. Fabric and clothing evoke an intimate, personal medium to carry people’s hopes. We sleep between fabric, wear it, sweat in it; we soak our tears with it. The participants’ written hopes are that personal. Our hopes are in our daily lives at all times, whether or not we acknowledge them. By repurposing the six grates (10ft x 6ft individually) at Canan Commons to serve as six large looms, the project creates a physical space for dialogue and collective dreaming, and also highlights Muncie’s charms and opportunities. Over the course of the month, the grates transformed from a row of six singular grates to six large looms, to a cohesive wall (10ft x 46 ft) -- one that does not separate the city nor is based on fear, but one constructed on hopes to unite Muncie. Although Kacie Lyn Martinez’s role in the project lasted the month of August, the project will remain in Canan Commons through the autumn of 2018, weather permitting. Residents are encouraged to engage with the project until it’s deinstallation. 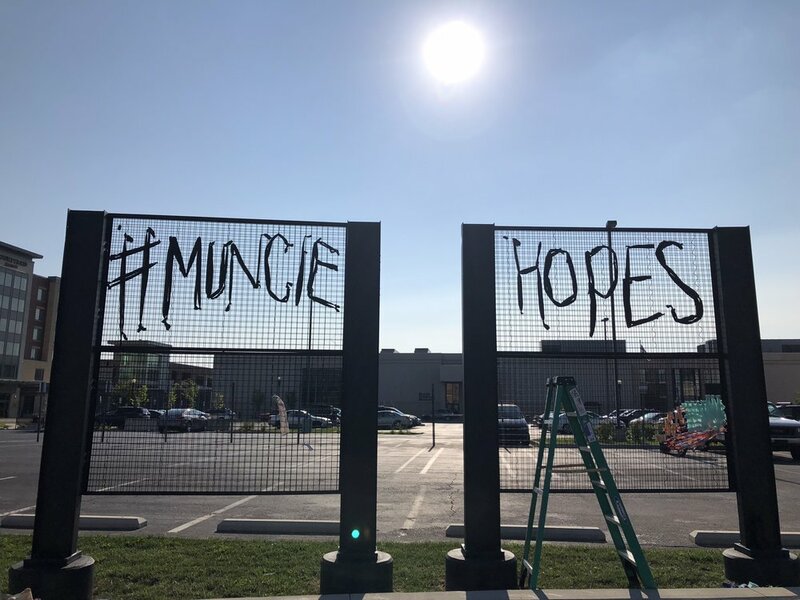 Participation was crowdsourced under the social media hashtag #MuncieHopes. Kacie Lyn Martinez would like to acknowledge all of the donations, volunteers, the support of PlySpace and the Muncie Arts & Culture Council, and the ongoing emotional support necessary to develop this project. A sincere thank you! An essential component of this project was physical, emotional, and conceptual accessibility. By doing so, participants were able to begin participating quickly, bringing together broad contributions across generation, class, political affiliation, gender, ability, and race. Recycled fabric and markers were the primary materials, easing any intimidation in participating in a public art project. People grabbed these conventional tools often unhesitatingly, directing their curiosity and attention to their ideas and feelings. The use of handwriting in this piece was a powerful one. Reading people’s individual hopes in their handwriting created a humanizing, personal, and equalizing tone to the environment. 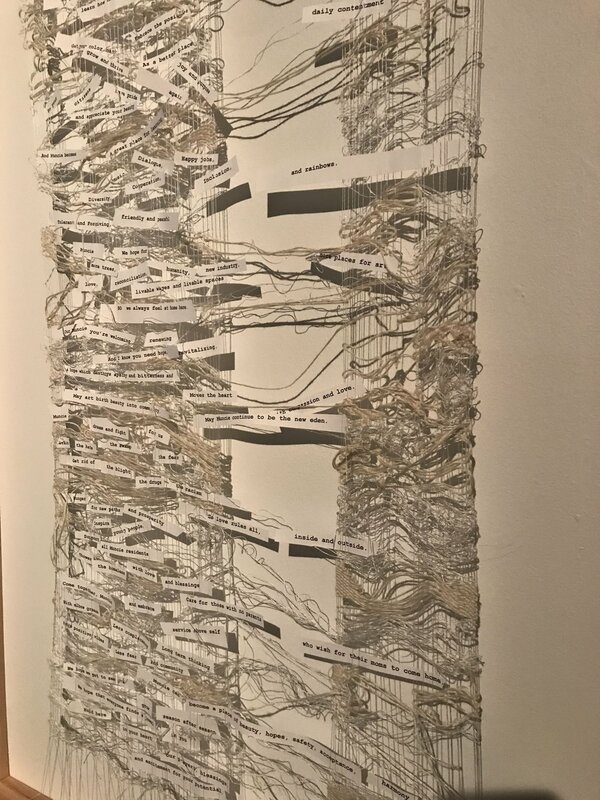 Conceptually writing hopes on fabric, something intimately a part of our lives, participants connected the themes of familiarity, daily life, and our hopes for the future. Additionally, the image of ‘The Wall’ is something built on fear in order to separate. As an act of reclamation, participants were physically weaving their hopes into grates to create a unifying wall of hope. Dozens of Muncie residents noted the kismet of the hopes we wear on our backs project to the pivotal growth point Muncie was currently experiencing. On a systemic, city-wide level, there’s new vibrancy and momentum to build opportunity for different communities in Muncie. A former Muncie resident visiting his family discussed how quickly the downtown had transformed in the past decade, seeing it as a focal point for transformation and economic investment. A Ball State University faculty member added that the former geographical separation between campus life and the rest of the city including downtown has become more fluid, attracting university students, and giving new life to parks and businesses. The redevelopment, one public art participant shared, makes it the perfect time to garner wider civic engagement in these discussions of Muncie’s future. One local business owner said that the project comes after a group in the community decided to change their critical attitude toward the city last year, and act with optimism and generosity toward Muncie as their home. It was as if this momentum and fertility was in the air. Another major component of the project was creating a space of curiosity, play, and experimentation -- without rules. By providing a suggested framework for participation (writing a “hope strip” and weaving it into the grates) without any compulsory action nor anyone regulating behavior, the process of hoping was open to interpretation and the decision of participants. I saw people experiment with fabric materials, weaving designs, their stripes, and how they engaged with the wall. Engagement included spending hours at the wall, explaining to newcomers how to participate, or looking a single hope before leaving the site. Participation for this project is much broader than those who added strips. It also includes the numerous residents who lived near the site, who would pick up strips that flew off the grates after a storm, and would collect them and weave them back into the grates. I saw a stewardship of this wall, which exemplifies the need to have a wide definition for participation. More than that, it signifies something I saw in numerous ways: people were taking collective ownership over the hopes we wear on our backs. Numerous participants expressed genuine surprise at how positive and loving the hopes were, as they expected a more disparaging tone. On one hand, I believe an outsider can neutralize tensions in a place of toxic pessimism and infighting. On the other, the hopes we wear on our backs created a destination for vulnerability. “Hope strips” ranged widely, from personal aspirations to long-term visions for Muncie. Physically weaving and inviting residents to participate created a vulnerable dynamic for me as the artist, out in front asking for people to join me in dreaming. I both modeled the vulnerability of publicly dreaming and holding a very public space for people to hope alongside me. It makes so evident the need for more public spaces of play and vulnerability. While the hopes we wear on our backs was an impactful visual symbol of the collective power of hope, most people could only engage with fragment of the hopes, leaving the wall often inspired by individual’s but without a helpful way of digesting more than a handful of hopes. I had an additional role to play, as one that synthesized these voices in a way that celebrated multitude and diversity while expressing a more cohesive vision for Muncie.